Decorating your reception venue is one of the most important things that you will do at your wedding; short of saying your vows, of course. 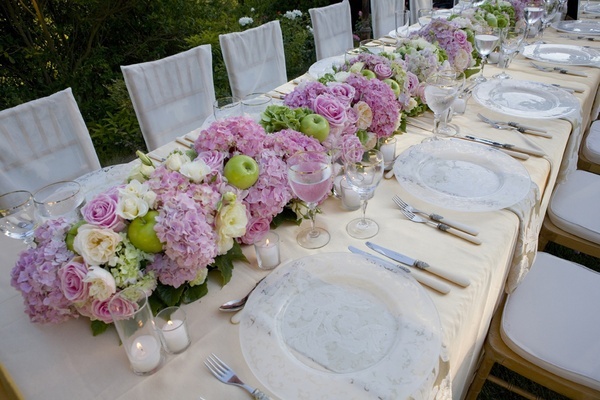 Considering all of the money that you will spend on items like tablecloths, balloons, and flowers, creating centerpieces for tables that really stand out should be a priority when you begin your decorating process. Though most people just stick to one of the many styles of floral centerpieces that are available for their reception tables, mixing in a few other items can make them a lot more special and unique. If you’re trying to keep your wedding on a low budget, swapping out flowers for something else can be an attractive option as well considering wedding flowers are so expensive. Here are a few items that can be used in conjunction with flowers or all by themselves that will really make your centerpieces one of a kind. Candy is a traditional item that is used in wedding centerpieces, but usually it is just spread out on the table around the base of the vase for the guests to enjoy. Consider choosing something that is either very long or includes a stick to mix in with your flowers or replace them all together. Items like Tootsie Rolls, Charleston Chews, or even Lollipops can make great candy “bouquets” that work perfect for a centerpiece and will really make them stand out. Another option for your centerpieces is to replace the traditional real flowers with ones made out of wood. Wooden flowers are by far less expensive than real ones, and they look just as beautiful in your centerpieces. Best of all, since wooden flowers don’t dry out or rot, your guests can take one home with them at the end of your reception as a wedding favor or keepsake to remember your special day forever. Sparklers are a very popular item to hand out at weddings, and including them in your centerpieces is a very efficient way to dispense them to your guests. You can mix your wedding sparklers in with flowers, candy, or whatever else you decide to craft your centerpieces from or you can use them as a standalone solution. Some of your guests may not realize that they are sparklers or understand what they are supposed to be used for, so I always suggest placing a little instructional card near the centerpiece so everyone understands that they are wedding sparklers and when they should be prepared to light them. If you want to really make your centerpieces stand out and be useful, my favorite idea is to create them out of fresh fruit. You could make fruit kabobs or just place a bowl of fresh berries in the center of each table; there is really no wrong option here. I’ve even seen it where the bowls to hold the fresh fruit was made from the rind of a watermelon instead of made from glass or plastic to really get the point across. Creating wedding centerpieces that stand out can be as simple as mixing in some wedding sparklers along with your flowers or as elaborate as creating a fresh fruit centerpiece down to an edible bowl. There’s no wrong way to decorate your reception tables with centerpieces, but doing something unique can make a huge impact on your overarching wedding theme without a lot of time, money, or effort.